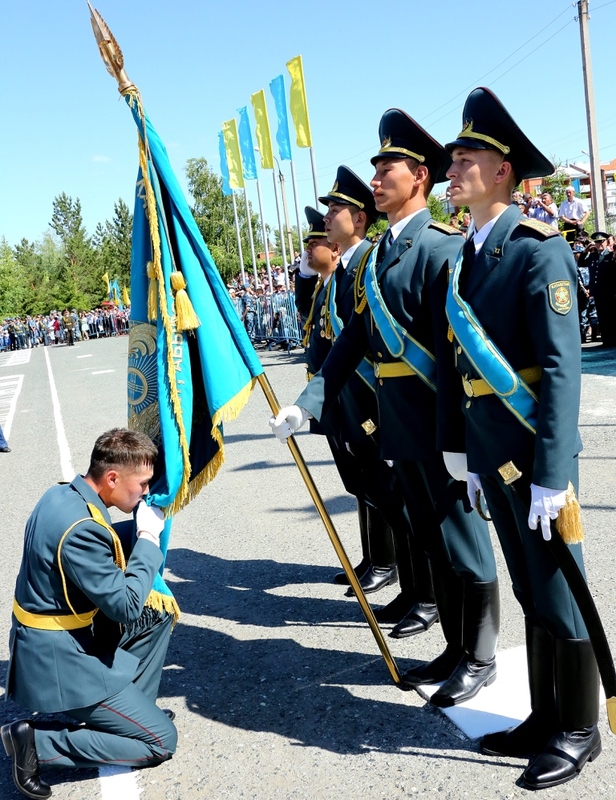 On June 14, 2014 at Military institute of Internal troops of the Ministry of Internal Affairs of the Republic of Kazakhstan the significant event took place – this year the 14th release of officers was carried out. 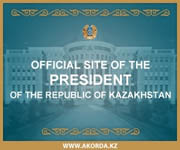 It the 2nd international and it is the 1st release of officers for National Guard of the Republic of Kazakhstan. In a festive atmosphere to cadets of 4th course are given the officer rank «lieutenant» and diplomas about the graduation from HIGHER EDUCATION INSTITUTION. At a ceremony of delivery officer a shoulder strap Akim’s deputy of the North Kazakhstan area Kuanganov Farkhad Shaymuratovich, the deputy of the Commander in Chief of the National guard of RK the major general Matkarimov Albert Polatovich, the deputy commander of the Internal troops of the Ministry of Internal Affairs of the Republic of Tajikistan on combat training the colonel Odinayev Hokimbek Safarbekovich, the deputy head of department of shots of the National guard of the Kyrgyz Republic lieutenant colonel Syyrbekov Toktogul Syyrbekovich, the chairman of the board of veterans of National guard of the Republic of Kazakhstan major general Tokushev Kaliakpar Zhubanyshevich, the chairman of the board of veterans of the North Kazakhstan area Ileyusizov Iskendir Ismakovich took part. In general the Military institute in the current year sent to parts of our republic and neighboring countries, including graduates of the foreign states of 257 officers. Together with the Kazakhstan graduates of a rank and diplomas were gained on nine representatives of the Kyrgyz Republic and the Republic of Tajikistan. 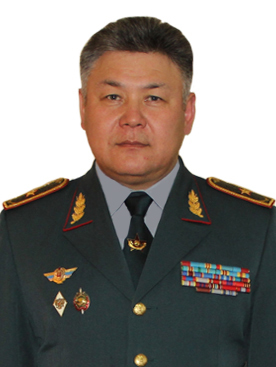 Seventeen people graduated from institute with honors, six graduates: Akhmetzhanov Zhasulan, Zharmukhanbetov Erzat, Esetov Baubek, Saypash Erasyl, Serikov Alisher, Tursunov Hurshed (the representative of the Republic of Tajikistan) with delivery of a breastplate “Askerin oku ornyn uzdik bitirgeni ushin». Their names will be brought on the Honour roll of Military institute. In seventeen years, including present, Military institute carried out fourteen releases, having sent to troops of 2538 officers, from them 198 people graduated from institute with honors, 26 graduates with delivery of a breastplate “Askerin oku ornyn uzdik bitirgeni ushin». Also at a ceremony of solemn delivery lieutenant a shoulder strap and diplomas to graduates there were representatives of the Main command of National Guard, local government bodies, public organizations, the Kyrgyz and Tajik Diasporas of SKO, veterans of National Guard, parents and relatives of graduates. After carrying out official part demonstration performances of the military personnel of institute were shown to attention of guests: a parade-ground concert from the Military orchestra; execution of front receptions with carbines and a fashion show with checkers; performance of ensemble of drummers. Display of hand-to-hand fight, acrobatic tricks, rhythmic gymnastics under composition «Alga zhigitter». Then for staff and guests of institute the concert program began – for them the duets «Sixth Sense», «Samgal» sang songs. The singer Natalya Zaytseva, our singer – the cadet of the 1st course Tazhibayev Aybol. The national Aray ensemble did some dancing turns. The artistic director of ensemble is Dilyara Sabyrova, her wards finished official part an officer waltz together with graduates, and after a waltz newly made lieutenants started a design from balloons with an inscription: «the 14th release» which as by request in the sky was carried away by a strong flaw. Also we will wish to young lieutenants of a fair wind!